The studio, 1 and 2 bedroom apartment homes of Camden Buckhead Square are in the heart of Buckhead Village. Live in the perfect location with urban conveniences and neighborhood charm. The home of your dreams should be spectacular, and you get it all within your sanctuary at Camden Buckhead Square. Stylish features including bright quartz and granite countertops, custom cabinetry, stainless-steel appliances, and quality Moen fixtures add to the interior luxuries. Perfection is in the details. Amid the thriving neighborhood of Buckhead Village, you are walking distance to the new Buckhead Atlanta retail development and all of the great local restaurants. You will appreciate the convenient and easy access to Peachtree Road and the office hubs of Buckhead, Midtown and Downtown Atlanta. There are a lot of reasons you’ll find the apartments at Camden Buckhead Square the perfect place to call home. These non-smoking community amenities—like our lush courtyard and pool, gourmet grilling areas, private ramada and deluxe outdoor bar—create the experience of a luxury retreat. Use the space in our multifunctional clubroom with WiFi lounge, various seating centers, and entertainment kitchen or log in at our WiFi enabled workspace making telecommuting ideal.Stay in shape at our fitness club with Life Fitness cardio equipment or at our yoga and spin studio with on-demand fitness videos & TRX training system. The bike shop with a repair station, electric pump and individual bike hooks for storage will be an advantage for any bike enthusiast. Electric car charging stations are also available in our parking garage. We are a pet-friendly apartment community and we welcome up to three pets per apartment! Let your dog run in our off leash dog park and then pamper your pooch in our dog spa that includes a wash station and drying table with blowers. They will love the community too. Come home to Camden Buckhead Square, where you will #LiveLoveBuckhead. Call today to make an appointment to see your beautiful new apartment home! Get the perfect spot! We have ample parking for our residents within our controlled access garage on a first come, first served basis. 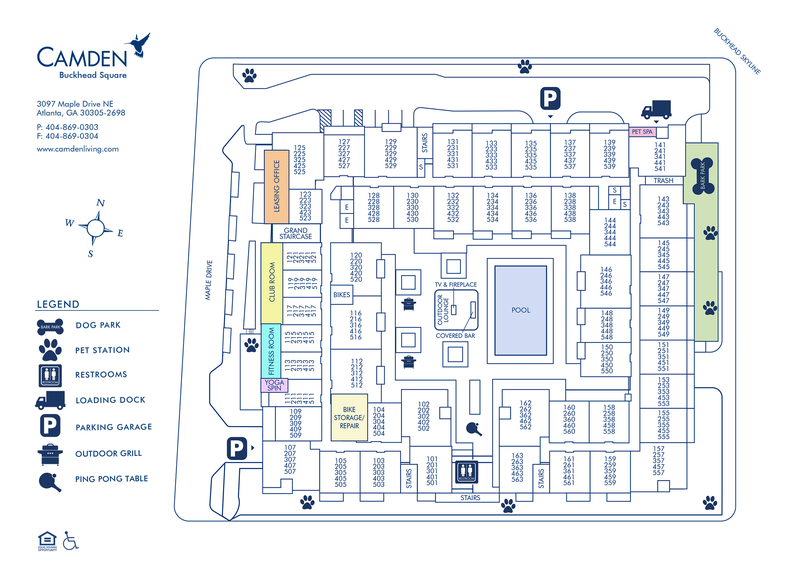 Visitor parking is available on the first level outside of the parking garage gate.